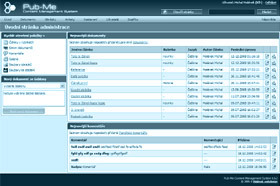 If Pub-Me CMS has attracted your attention, you can touch it with your own hands - order access to this trial administration. I would like to get access to the demoversion of Pub-Me CMS. You can try whether working with Pub-Me CMS is really simple and easy. If you are interested in checking out the demoversion, write to us to and get access information. What will you find in the demoversion? In the demoversion, you can try work of an administrator with “editor” access rights. You can add articles using a template, learn to work with a document tree, create a new gallery, learn about what the interface of the WYSIWYG editor looks like. What is NOT in the demoversion? What you can see in the demoversion is the real system right after an installation but as seen by an administrator at the second lowest level. For security reasons it is not possible to add new files to the server, you cannot create new administrators, registered users, export the website, create new language versions, edit user comments etc. All these and many more is included in the system but this trial version wants to introduce you to the basic principles of controls and not to overwhelm you with all the bunch of functions it supports. If the system attracts your attention after you try the basic functionality, we will be glad to present its complete functionality to you including advanced features such as creation of (x)html templates, add-ins, programming of new functionalities etc. What do I need to run the demoversion? Simply speaking, you need a computer connected to the Internet. A more detailed description can be found on a page dedicated to system requirements.